For you who have voted Fianna Fáil come rain or shine, this must be the most difficult election you have ever had to face. In Irish politics, loyalty is a massive factor. For many their party is up there with religion, country, family, team. It’s an identity that has been with them all their life – or longer. But more than just identity, it’s an active relationship. There is give and take. Fianna Fáil – indeed most Irish political parties – like to cultivate the myth that they will reward your personal loyalty with personal preferential treatment. In the overwhelming majority of cases they do no more than get their secretaries to make the same call to a government department that you could have made yourself, but many prefer the personal attention of a TD. And the TD knows that people really will reward that attention with a vote, even if they are getting nothing they’re not entitled to. Indeed if a TD did break the rules to favour you over your neighbour they would be guilty of corruption. So would you. Real corruption is rarely so direct – and rarely comes as cheap as a vote. It’s a daily fog in politics, a subtle miasma of moral compromises. Why not help out a friend who’s making their way in business or finance? Your decision will favour someone or other, so it may as well be someone you know. That’s what it’s all about in the end, isn’t it? Personal loyalty. And then when you leave government, why not accept a seat on the board of a company you may in some small way have helped become what it is today? And sure when the company has another problem, are you not going to be meeting an old colleague from the party only next week? So through a friendly process of decent personal loyalty, we find ourselves in a situation where a lot of our representatives ended up surprisingly rich, and the interests of banking and property were put before the interests of people. And that includes those people who voted for them, for years and for generations. Loyal Fianna Fáil voters are lying on trolleys in every hospital in the country. Where we are now is where loyalty got us. Ruined, indebted, dependent, shamed. I know it will be hard when you see the face you know on the ballot, but I beg of you to leave them off your vote completely. 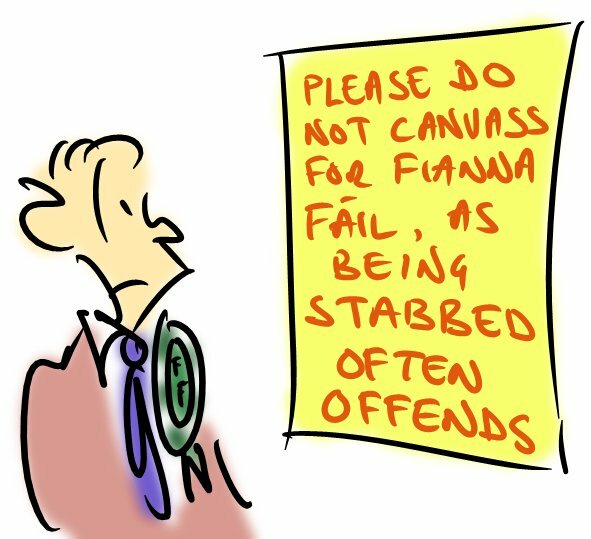 There is a real danger that so many people will feel sorry for Fianna Fáil in their defeat that they will actually do far better than expected. If they are ever going to change, that must not happen. They were a great party at one time, they did many good things for ordinary people over the years. If they are ever going to be great again – good for the people who gave them their loyalty rather than good just for the wealthy – they first need to spend time in the wilderness, thinking about what they have done.